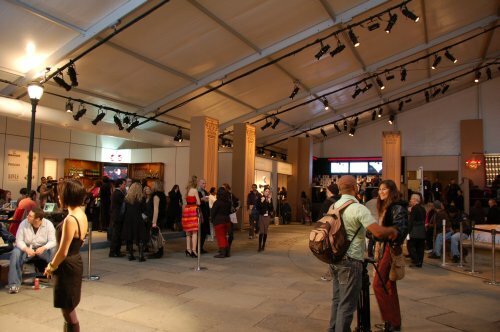 After all my work at Fashion Week last year (during which time I saw Julia Allison and Sigourney Weaver, and missed seeing Donald Trump, even though he was right next to me), it turns out IMG finally decided upon Lincoln Center as the new location for the biannual event. So they decided against relocating Fashion Week to the Port Authority Bus Terminal, even though it already hosted a practice run. I guess that means my work is done. By the way, is this anyone famous? This entry was posted on Tuesday, February 3rd, 2009 at 9:39 am	and is filed under bus, fashion. You can follow any responses to this entry through the RSS 2.0 feed. You can leave a response, or trackback from your own site.